A lot has been said about shopping local. One more benefit? Retailers who wrap. My sister, a mom of two young children, actually strategized her entire holiday shopping plan last year based on stores that wrap. Local shop owners understand that it’s time-saving services like these their customers appreciate. “I take call-aheads, help pick out the gifts, and even customize the wrapping to the child’s favorite color with ribbon to personalize it, at no charge,” said Crystal Newman, owner of Bloomsbury Lane Toy Shoppe in Lancaster. Here’s a sampling of local stores—with a rundown on their approach to wrapping. For $1 per gift, this East Aurora shop will package your purchase in a ribbon-handle bag and choice of tissue paper. For smaller items like jewelry, the store offers small gift boxes topped with gold and silver bows. The toy store offers free wrapping with tissue paper and colored ribbon to personalize it. You can call ahead with requests–for example, a gift for a 7-year-old in the $30 range–and they’ll have it wrapped and ready by the time you get there. Head Over Heels will package your gifts for free in their brown paper gift bags with geometric tissue paper, curling ribbon and accented burlap knots. Gift and apparel store Molly + Kate will wrap your items free of charge with pretty white-and-navy striped paper, or in gift bags with tissue paper featuring metallic-gold stags. You can also order gifts online and pick up your wrapped gifts later. 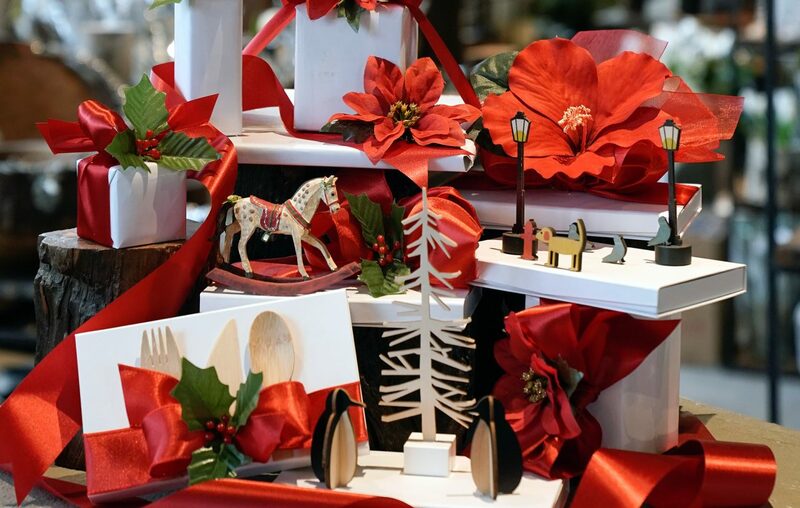 Neo will wrap your purchase, free of charge, with the store’s signature look: a white box with a red or gold ribbon, topped with a decorative silk poinsettia or holly. Renew’s wrapping—included with purchase—includes white boxes with the store’s signature logo paper, shrink wrapped and finished with handmade blue or green bows. If you order online, just check off the gift wrap option and it will be ready when you get there. Tony Walker takes its gift program a step further by shipping your wrapped gift free anywhere in the U.S. Their houndstooth paper is a signature part of the store’s brand. Village Artisans, which features locally mad gift items, offers free wrapping with its red and white polka dot paper, green or red tulle and various colored ribbons. Wild Things puts a lot of love into its free wrapping, varying their approach with vintage paper and bows, Chinese wish papers and/or flowers or sparkly toppers. Jewelry is also packaged in hand-stamped muslin bags.